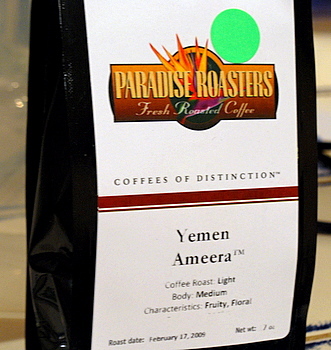 I’m not sure that I’ve ever tasted a coffee from Yemen before tasting Paradise Roasters’ Yemen Ameera. It’s a light roast coffee, and the roaster describes it has having floral fruity notes. For me, this coffee has fruity notes in the same way that dark chocolate does because it smelled and tasted a lot like very dark chocolate. It had deep cocoa notes – and bitterness to match them – a hint of fruitiness, and a very bright acidity. Surprisingly, it had a pretty clean finish and most of the flavors faded away smoothly, so you’re not going to be left with an overly acidic taste in your mouth. Also like dark chocolate, I suspect that this coffee is not for everyone. If you prefer mellower, smoother milk chocolate for its rich sweetness, than the relatively intense dark chocolate-ness of this coffee probably isn’t going to be right for you.